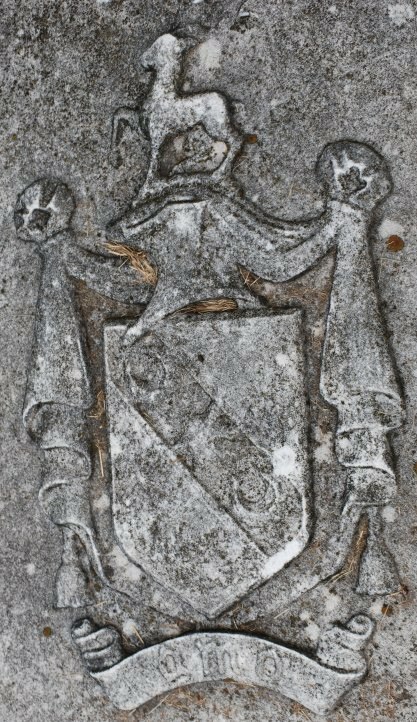 For our next heraldic memorial, we have a "two-fer," the graves of a father and son, both bearing the same coat of arms: George Cole Scott of Ballyshannon (1875-1932) and George Cole Scott, Jr. (1909-1962). George Cole Scott, Sr. was a delegate from Virginia to Republican National Convention in 1932. 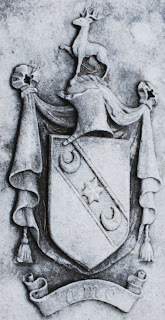 The arms from his grave are on the left; those of his son, George Cole Scott, Jr. are on the right. There is a clear difference in the quality of the materials used for each monument, as the older arms (for the elder Scott) are in far better shape than the arms for his son. The arms may be blazoned as: Or, on a bend azure a mullet of six points between two crescents argent. The crest is: A stag trippant, and the motto is: Amo (I love). Or on a bend az. an estoile betw. two crescents arg. Scott, Ireland. The patriarchal coat of Scot or Scott. Scott, Baron Earlsfort 10 May 1784, Viscount Clonmel 18 August 1789, Earl of Clonmel 20 December 1793. Or on a bend az. an estoile (or mullet) betw. two crescents of the first. Scot, Buccleuch, as borne on an inescucheon by James Crofts afterwards Scot, Duke of Monmouth after 22 April 1667, as Duke of Buccleuch, Earl of Dalkeith, Baron Whitchester and Ashdale 20 April 1673, Z, 639 ; and after his attainder, 1685, by his son James Scot (Earl of Doncaster afterwards) Earl of Dalkeith, Z, 644; and by his son Francis Scot, Baron Tyndale and Earl of Doncaster 23 March 1743, Duke of Buccleuch 1732 ; and by his uncle Henry Scot, Baron Goldylinds, Viscount Hermitage, and Earl of Delorain29 March 1706, extinct 1807; Z,644. Fairbairn's Crests says the motto “Amo” (I love) belongs to “Douglas, Hoops, Montagu-Scott, Scott, and Scote. The next stop in our tour of Hollywood Cemetery in Richmond, Virginia, is the grave of James Branch Cabell (1879-1958). His arms may be blazoned: Sable, a horse rampant argent bridled or. The crest is: A horse as in the arms, and the motto is: Impavide (roughly, Undauntedly). 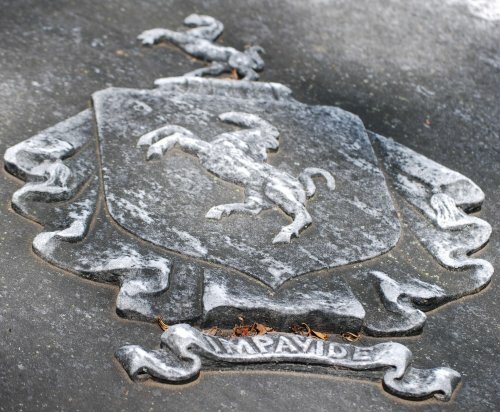 Impavide is also the motto of the 90th Missile Wing, a unit of the United States Air Force Global Strike Command, 20th Air Force, stationed at Warren Air Force Base just west of Cheyenne, Wyoming. Burke's General Armory gives: Cabbell or Cabell: Vert fretty argent, overall a fess gules. Crest: An arm in armor embowed the hand grasping a sword, all proper. Another crest: A square padlock or. Motto: Impavide. Except for the motto, none of this matches "our" Cabell here. Crozier's General Armory, however, cites: Capt. William Cabell, Virginia, 1700. Quarterly, first and fourth, Sable a horse rampant argent bridled or; second and third, Azure ten estoiles or, four, three, two and one. Crests: (1) An arm in armor embowed the hand grasping a sword, all proper. (2) A crescent argent surmounted by an estoile or. Apparently no relation to this Cabell, or at the very best but a distant one. Papworth's Ordinary of British Armorials, however, notes Cabell, Buckfastleigh, county Devon: Sable a horse upright argent bridled or, a good match to the arms on the grave here. 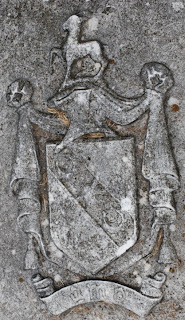 Our next bit of heraldry is found on the monument to Joseph Miller (1797-1860), brother of Mrs. Mary Ann (Miller) Harper (1803-1877), who erected this memorial to him and was herself buried there. Miller was a Marine Engineer and elected as a Fellow of the Royal Society of London (its full name is the Royal Society of London for the Improvement of Natural Knowledge) on March 30, 1843. A coat of arms appears in two places on the monument, at the top of the column and again on its base. It is quite clearly a single rampant lion on the field. There is also a shield shape on the center front of the column, which I will discuss below. Burke is of no assistance in finding this coat of arms; none of the Millers he has listed bear a rampant lion on the field. 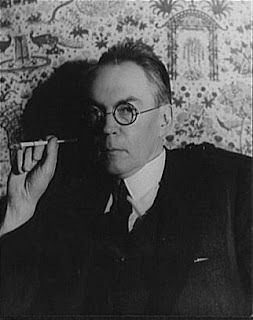 Papworth might possibly be of some help, but he had 34 pages of entries consisting of [Field] + [Beast, Lion], and I have no desire to go blind today reading through all of those entries looking for “Miller”. 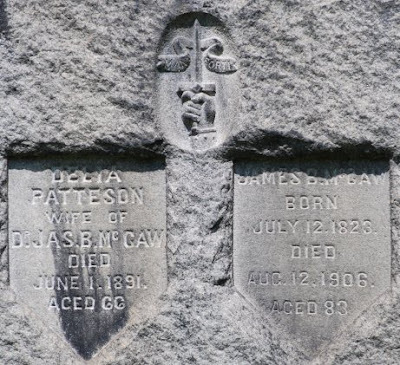 All of the information about her brother Joseph and his life and accomplishments is carved on the sinister side of the monument (as you look at it from the front), filling up nearly its entire height. Our next armorial memorial is that of Dr. James B. McCaw (1823-1906) and his wife, Delia (d. 1891). 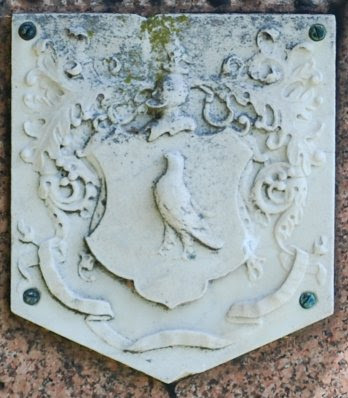 It does not contain a coat of arms (although the names of Dr. McCaw and his wife appear on shield shapes), but a crest (though without a torse). It took me a while to decide whether the capital C in McCaw was a C or a G; after careful comparison with the other Cs on the stone that pretty much had to be a C and not a C (like the one in Mc), I decided that it had to be a C.
I didn’t find anything for McCaw in Crozier’s General Armory, Burke’s General Armory, or Fairbairn’s Crests. However, Fairbairn’s gives this crest, In hand a dagger erect proper, and motto, Manu forti (With a strong hand), as that of McCaa (Scotland). Burke’s has no listing for McCaa or McCaw. But typically there would not be a crest without an accompanying coat of arms, so I looked a little farther afield in potentially related spellings. * Finally, under MacKay, we have the arms Azure on a chevron or between three bears’ heads couped argent muzzled gules a roebuck’s head erased between two hands issuant from the ends of the chevron each holding a dagger all proper, with the crest A dexter arm from the elbow erect, holding a dagger in pale all proper pommel and hilt or, and with the motto Manu forti (Baron Reay, and with differences [bordure gules, engrailed bordure or, and wavy chevron] to several other MacKay’s in the middle to late 18th Century). Going back to Fairbairn’s and looking under MacKay, we find: A dexter cubit arm erect, in hand a dagger in pale, all proper, hilt and pommel or, with the motto: Manu forti. * Spelling changes occurred regularly on this side of the Atlantic, though not, as is often supposed, at Ellis Island. One reason was the lack of standardization of spelling until the later 1800s and the publication of Noah Webster’s dictionary. Even Mark Twain is supposed to have said that he didn’t have any respect for a man who couldn’t think of more than one way to spell a word. The other reason is that the person who wrote the name was not always the person who bore it, leading to misspellings from mishearing or misunderstanding the name. In my own family, the surname Forbes turned in two to three generations into Forbush, by way of New England clerks writing the name as they heard it from the bearer, Daniel Forbes, who was born in northern Scotland and apparently had a strong Gaelic accent. Forbes (two syllables, FOR-bess) became in the ears of at least one clerk "Farrabbas," and shortly thereafter turned into Forbush. Crozier’s General Armory gives the arms as: Sable, a falcon close argent, armed or (another: beaked, membered, jessed and belled or), one charged on the breast with a cross (John Bolton, New York), the other with a trefoil slipped proper (Robert Bolton, Pennsylvania). Crest: A falcon of the shield (the other: A falcon close argent as in the arms). Bolton (Bolton, co. Lancaster) Sable a hawk argent. Crest: A hawk belled argent. Bolton (Lord Mayor of London, 1667). Same Arms. I don’t see anything on the breast of the falcon in the arms here, but that does not necessarily mean that nothing is supposed to be there. 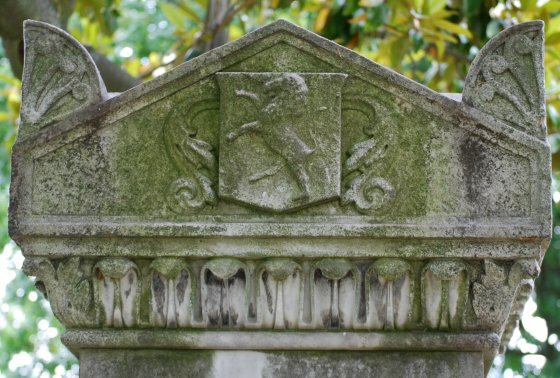 To finish up the pictures of heraldry from our recent trip to Virginia, I’m going to include some of the coats of arms that I found in our tour of Hollywood Cemetery in Richmond. 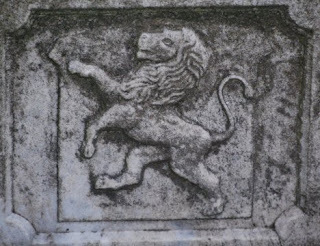 Let me say right off the bat that I like walking through old cemeteries; not only are there often a lot of interesting sculptures and headstones, but you can often find heraldry in one form or another. 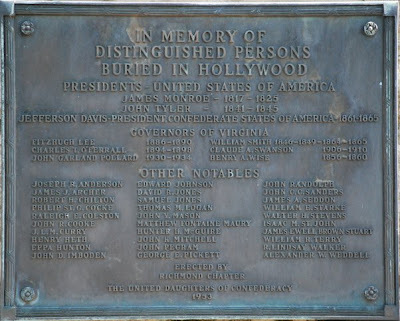 And Hollywood Cemetery was not only a trove of such finds, it’s also got a lot of famous people buried there. 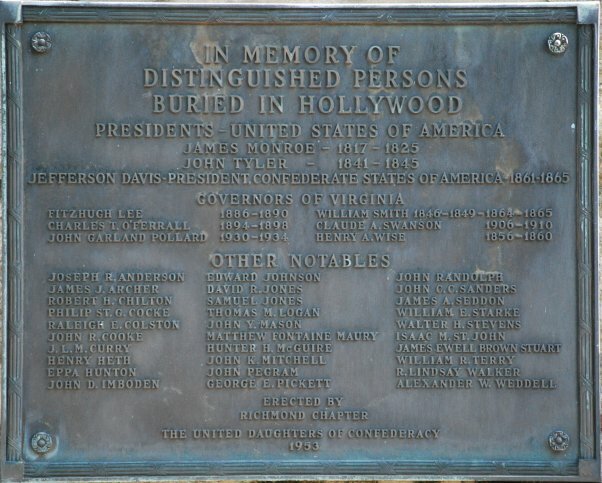 Two American Presidents, one Confederate President, several generals, politicians, and other folks who made a name for themselves doing one thing or another, as you can see from the plaque (above) placed near the entrance. I noticed, as we were walking the grounds, several examples of what is not really heraldry, but is definitely a shield, right down to the gige, the leather strap by which the shield was slung across the shoulder or across the neck and shoulder. We drove on out to the Cape Henry Lighthouse on the Atlantic shore in Virginia (actually, there are two lighthouses out there, the old original one and the new one; we were there to see the old one). I knew that there was a chance of seeing some heraldry – in addition to my belief that you can find heraldry everywhere, the lighthouse is, after all, on a military base – but I also knew that the chances of getting any good photographs of it were slim (the lighthouse is, after all, on a military base, and they’re awfully wary lately of people taking pictures willy-nilly). However, I did get one. 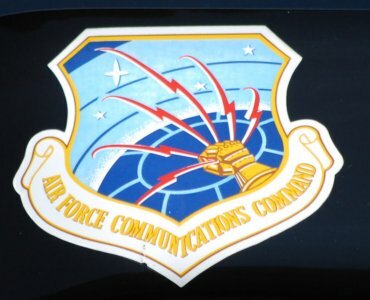 On the leading edge of the hood of a pickup truck (one of the larger Toyotas) in the parking lot for the old lighthouse was a sticker/decal with the arms of the U.S. Air Force Communications Command. Not, to my mind, the best in heraldic design, it is nonetheless heraldry. And sometimes you just have to be satisfied with that. Arms: Gules[? ], a chevron between three leopard’s faces or. Crest: A leopard’s head erased gorged of a coronet or. 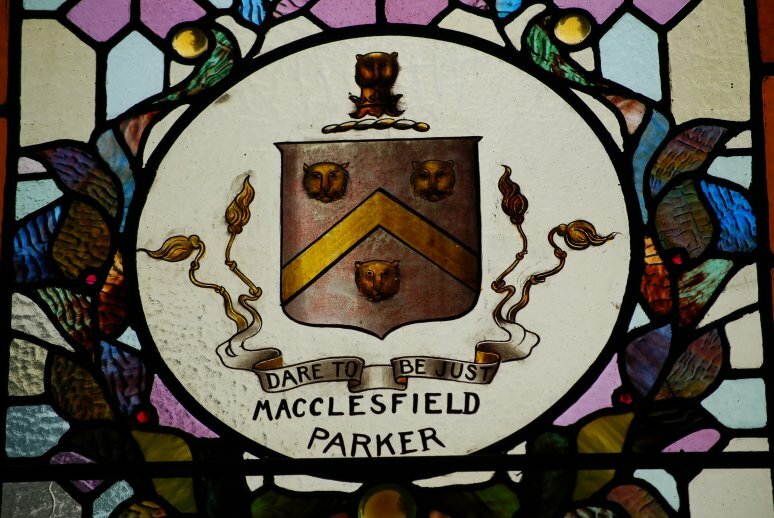 Under “Parker (Earl of Macclesfield)” it says “Same Arms and Crest” as Parker of Norton Lee’s and Parker of Park Hall. Parker (Norton Lees, co. Derby, temp. Richard II; the heiress m. Barker). Gules a chevron between three leopards faces or. Crest: A leopard’s head affronty erased or, ducally gorged gules. 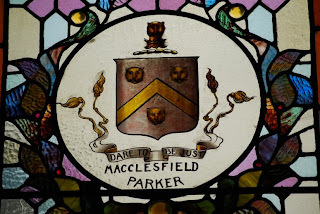 Parker (Park Hall, co. Stafford; a younger branch of the Norton Lees family and the senior line of the noble house of Macclesfield). Same Arms and Crest. It is possible that the coronet on the crest is supposed to be gules instead of or, but even on close inspection it’s hard to tell. It looks to me like it’s the same color and shading as the leopard’s head. 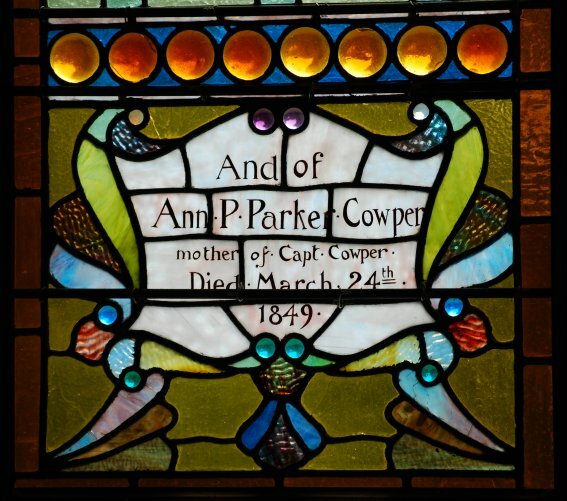 Ann Pierce Parker Cowper (the only daughter of Col. Josiah Parker, 1751-1810. He was in 1788, a Delegate to the Constitutional Convention) does not appear to be buried here, either. There is a stone to her memory at the Parker cemetery located on the old Macclesfield Farm about three miles east of Smithfield, but she is apparently not buried there, either. 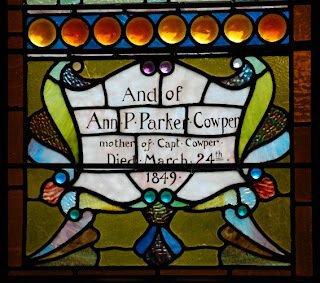 The words of the memorial window notwithstanding, Ann P. Parker Cowper seems to be best-known for her petition in 1816 to the General Assembly of Virginia seeking a divorce from her abusive husband. St. Luke's Church ("The Old Brick Church"), located near Smithfield, Isle of Wight County, Virginia, is the oldest existing church of English foundation in America and the nation's only surviving Gothic building. I have given the URL of their website below. It's a pretty church, and well worth the visit, even if you're not looking for heraldry. 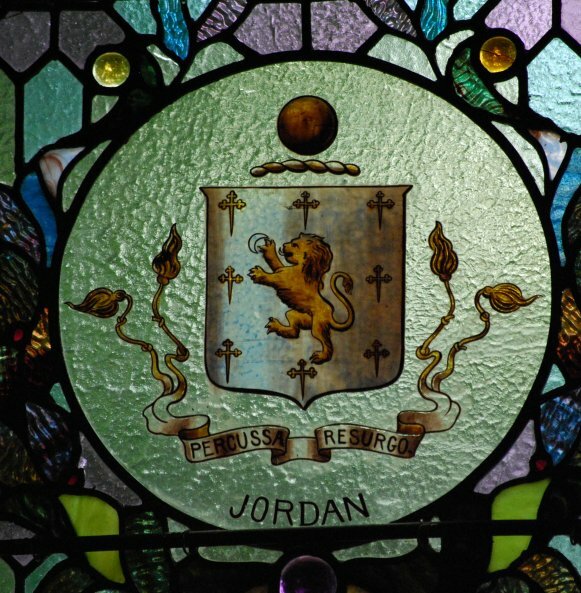 Anyway, they have a couple of stained glass memorial windows with coats of arms. I'll discuss the first today, and the second next time. Arms: Azure[? ], a lion rampant or maintaining in the dexter paw a decrescent bendwise sinister within an orle of [eight] crosses bottony fitchy or. The nearest Jordan arms in Burke are: Jordan (co. Somerset, and Chittern Whistley, co. Wilts, 1604) Azure a lion rampant between eight crosses crosslet fitchy or, a chief of the second (another, the lion charged with a crescent gules). Crest, A mount or, over it a scroll with this motto, Percussa resurgo. Another crest: A football proper. The blue of the field has largely disappeared, though it does show a bit in a close-up of the window. It is entirely possible that the crest here is a football proper; the color is far darker than the gold of the lion and crosses. Col. Jordan is apparently not buried in or near the chapel; at least he is not listed among the Miscellaneous Headstone Inscriptions list that I found. (However, the Church’s website at http://historicstlukes.org/ says that “Archaeologists believe that only ten percent of the markers still exist.”) Nor could I find out any real information about him, although I suspect that he is certainly related to the many Jordans who are buried in the church’s graveyard. He was, apparently, quite a character (in the very best senses of the term)!